1. Preheat oven to 160°C/325°F/Gas 3. Grease and base line two 20cm/8” sandwich tins, tins must be at least 1½ inches deep. 2. Sieve the flour, baking powder and cocoa into a large mixing bowl. Add the sugar and mix well. 3. Put the eggs, golden syrup, oil and milk into the dry ingredients and beat well. When mixture is smooth, transfer to the prepared tins. 4. Bake for about 35 minutes until cakes are risen and spring back when gently pressed. 5. When baked, turn onto wire tray and remove the lining paper. Allow to cool. 6. Cut each cake in half horizontally. 7. Make the icing by putting the chocolate and butter into a bowl over a pan of hot water. The base of the bowl should not touch the water. 8. Stir occasionally until melted. Remove from heat and allow to get cool and start to set. 9. Put half the cake for the bottom layer on a wire tray and place a baking tray underneath to catch the drips. 10. Spoon a little of the icing on the cake, spreading it evenly to the sides. 11. Repeat with the remaining cake layers, then pour remaining icing over the cake making sure it evenly coats the top and sides. 12. Leave to set then transfer to serving plate. Arrange the fingers around the cake. 13. Decorate the top with bunnies, truffles or eggs. 14. Finally tie a yellow ribbon around cake, if liked. Enjoy and have a very Happy Easter! 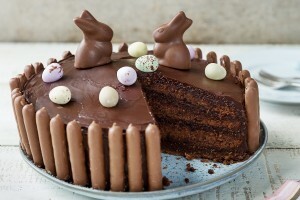 This entry was posted in Cake, Chocolate, Easter. Bookmark the permalink.